How should a School of Architecture be? That should be the question: how should a place where we teach how to build and design look like? 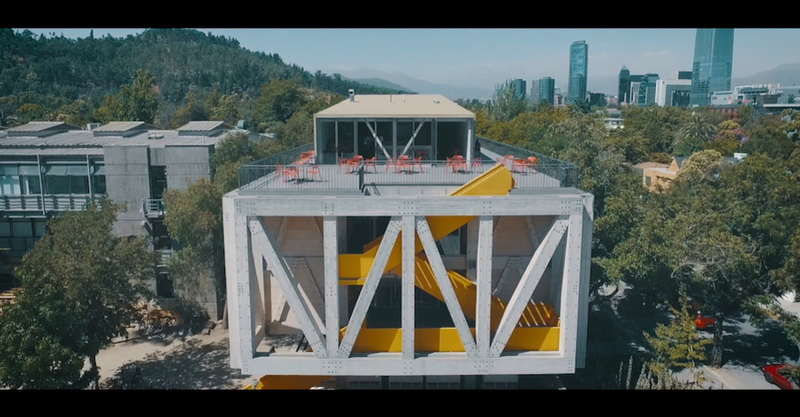 A short film by Eduardo Guiloff investigate the topic by exploring a School of Architecture in Chile. Located on the southern edge of the Lo Contador Campus, in 2015 a new construction hosting the School of Architecture was built for the Universidad Católica de Chile. The new building has a two floors laminated wooden structure: a simple, easy-to-assembly and transferable body, composed of modules. Gonzalo Claro, the architectural firm who in 2014 won the public contest to design the School, used wood in the construction of the building in order to take advantage of the dimensions of the panels and avoid the need for cuts that make up the floor structure. The result is a simple, yet fascinating space: Gonzalo Claro decided to leave the wooden skeleton exposed expressly to make visible how the structure works, how the loads are disposed along the vertical and horizontal development of the building. Eduardo Guiloff explores the building highlighting the easy-to-detect, honest structure of the space, using long, calm sequences, portraying not only the construction, but also the lives that unfold within this space. The short film goes through the building, guiding us from outside to inside and down to top, showing the structure and all the elements that make the School up, with a rhythm that feels faithful to its specific spatiality. An unfolded building: the Escuela de Arquitectura opens up to the students, an example from which they could learn from, while learning the basics to become one day architects, urban planners, experts.